Prior to the 1834 Poor Law Act, each of Lichfield's three parishes (St Mary's, St Chad's and St. Michael's) organized its own poor relief independently. Between 1691 and 1696, the corporation let a house on the south side of Sanford Street for use as a linen manufactory for the employment of the city's poor. The building continued on and off in such a role until it underwent an refurbishment in 1724, when part of it was adapted for use as a "House of Correction" (an early type of prison). By 1728, poor from St Mary's occupied part of the building. Also in that year, St Michael's parish took over the lower part of the building for pauper accommodation at a rent of 4d per year with the right to take in a garden and erect a pigsty. LICHFIELD contains three parishes — St. Mary's, St. Chad's, St. Michael's. The first has most houses and inhabitants. but no land. The others have few houses and much land. In 1781 there were 722 houses in Lichfield and 3,555 inhabitants The population is supposed to have increased considerably since, 408 houses pay tax, number exempted not ascertained. Prices of provisions: Beef and mutton, 5d. per lb. ; veal, 4½d. ; bacon, 9½d. and 10d. ; milk, ¾ quart for 1d. ; butter, 11d. per lb. ; potatoes, 4s. per bush. ; bread flour, 5s. per st. ; coals, 6d. per cwt. The wages of labourers are from 9s. to 12s. a week, according to the season. Women for weeding get 8d per day, for haymaking rod. and victuals. Those who spin lint earn 4d. to 6d. a day. There are 46 ale-houses, 5 friendly societies for men, 2 for women, with a membership of 100 to 200. Land near the city lets for £3 or £4 an acre. Average about 30s. Farms generally small. Tithes mostly taken in kind. The Poor are maintained at home, but St. Mary's and St. Chad's have each a Workhouse. The rates in St, Mary's are about 3s. in the pound on the nominal rental. In the other parishes half the rack rent is assessed. In St. Mary's Workhouse there are 41 inmates, who make a little blanketing for the use of the house. The bill of fare till very lately included puddings and bread and cheese dinners about 3 days a week. On account of the scarcity of bread and flour the following diet is used: Breakfast—every day, milk pottage. Dinner — Sunday, Tuesday, Thursday, meat and vegetables ; Monday, Wednesday, Friday, broth and cold meat ; Saturday, bread and cheese. Supper—every day, bread and cheese. 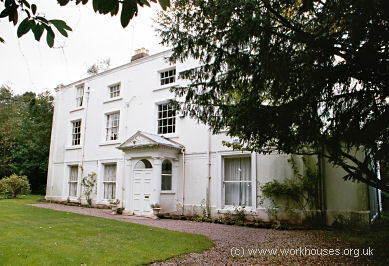 Rugeley erected a parish workhouse on Chaseley Road in around 1780. 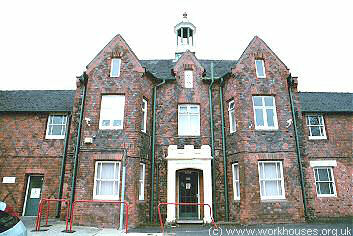 Rugeley former parish workhouse, 2004. City and County of Lichfield: St Chad (2); St Mary (3); St Michael (2). Staffordshire: Alrewas (2); Armitage with Handsacre; Burntwood, Edial and Woodhouses; Colton; Curborough and Elmhurst; Elford; Farewell and Chorley; Fisherwick; Fradley; Hammerwich; Hamstall Ridware; King's Bromley; Longdon (2); Manesyn Ridware; Orgreave; Pipehill; Pipe Ridware; Rugeley (4); Shenstone (2); Streethay; Swinfen and Packington; Wall; Weeford; Whittington; Yoxall (2). Later Additions: Alrewas Hays (1858-85), Brereton (1894-1930), Freeford (1858-1930), Fulfen (1858-1930), Haselour (1858-1930), King's Bromley Hays (1858-1922), Ogley Hay (1837), Shire Oak (1894-1930), Tamhorn (1858-1930). The population falling within the union at the 1831 census had been 22,747 — ranging from Wall (population 93) to Lichfield itself (total of 6,232 for all three parishes). The average annual poor-rate expenditure for the period 1834-36 had been £7,978. The new Lichfield Union's Board of Guardians met for the first time on 21st December 1836. Edward Grove was appointed Chairman, the Revd William Gresley as Vice-chairman, and Philip Dyott as Clerk to the Board of Governors. In addition, two relieving officers were appointed each at a salary of £100 per annum, and John Hewitt was appointed as Medical Relief Officer at £50 per annum (Leighfield). At a subsequent meeting on 9th March 1837, it was decided to advertise in The Staffordshire Advertiser , The Birmingham Herald , and The Wolverhampton Chronicle for "Plans and Specifications for a Workhouse to hold two hundred Paupers, in accordance with Mr Kempthorne's Model." The successful applicants were George Gilbert Scott and William Bonython Moffatt. 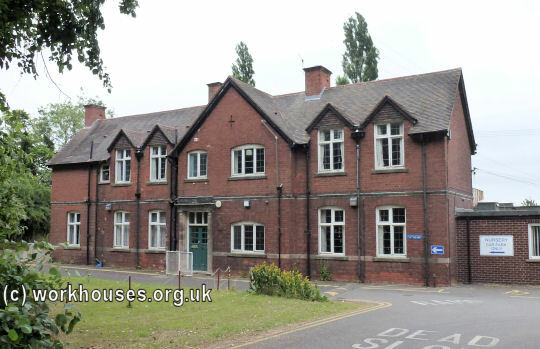 The building, which cost £2,939, was erected at a site on the north side of Trent Valley Road, on land purchased from Lichfield Corporation and from Lord Lichfield. The new building was to be constructed in red brick (made from the clay dug out from the workhouse foundations) embellished by blue bricks at the front and sides. The builder was William Sissons of Hull. Work began on 24th May, 1838, with a foundation stone being laid by the Chairman, Edward Grove. The building received its first inmates almost exactly two years later on 24th May, 1840. 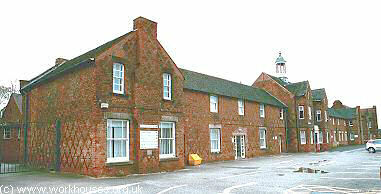 Up until this point, the Union had continued to use former parish workhouse accommodation from St Mary's in Sanford Street, and at Rugeley. The former workhouse later became St Michael's Hospital. 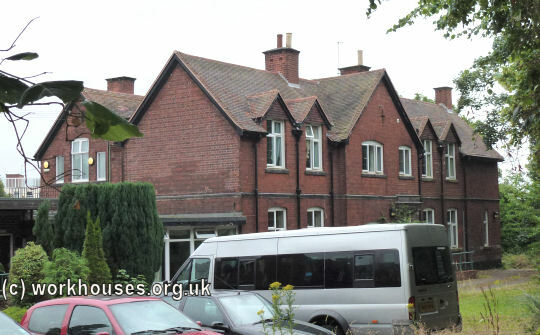 By the late 1890s, the Lichfield Union was sending children to the District Schools at Wigmore, with Roman Catholic children being placed in orphanages at Birmingham and Coleshill. In the early 1900s, the union rented house to accommodate boys in Tamworth Street, Lichfield, while the girls went to the Barnardo's Home at Barkingside in Essex. In 1909, the union erected children's homes (one for boys and one for girls) for pauper children on Wissage Lane (now Scotch Orchard). In 1924 the homes could accommodate 60 children, with A.E. Boardman as Superintendent. 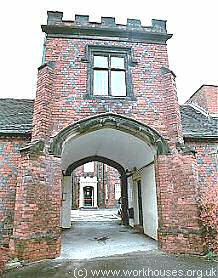 Lichfield Record Office, The Friary, Lichfield, WS13 6QG. Limited holdings include: Guardians' minute books (1836-1930) etc.